Once a private, domestic chore, laundry was big business in nineteenth-century Paris, where it employed roughly twenty-five percent of the female workforce. Steamy, dark storefronts, often open to the sidewalk, gave passersby a glimpse of women ironing, bare-armed in the heat. Born into an aristocratic family, Degas was fascinated by working women and by the increasingly porous distinctions between private and public, domestic and commercial in the modern city. His paintings of laundresses—none finer than the present example—reflect this fascination. Probably begun in the 1870s and reworked about a decade later, this picture suggests the brutalizing effects of hard labor. The women hunch, yawn, and drink over a pile of starched shirts, yet the peculiar delicacy of Degas’s touch—mimicking, in the flesh tones, his own work in pastels—reminds us of the laundresses’ youth and femininity. Paris was famous for its laundresses, who were skilled laborers in a demanding trade. Rich European families sent their linen to them from as far as Poland. French artists had overlooked this occupation as a subject for art—until Degas, and his friend, the novelist Emile Zola, began to take notice. Here, Degas chose a moment that emphasizes the monotonous nature of ironing and comments on the condition of the working class. On the right, a flushed worker bends over—her head tucked in, her arms straining, using all her strength to press down a heavy iron. In contrast, the laundress on the left lifts a hand to her stiff neck and raises her arm, stretching her tired bones. Her yawn conveys her exhaustion and the tedium of her repetitive job. The wine bottle she grips was a fact of life for these women. They often suffered from ailments like bronchitis and tuberculosis, and many of them drank. A pile of ironed-and starched shirts lies between them, and hanging laundry looms as a backdrop—both opportunities for Degas to experiment with subtle shades of white. 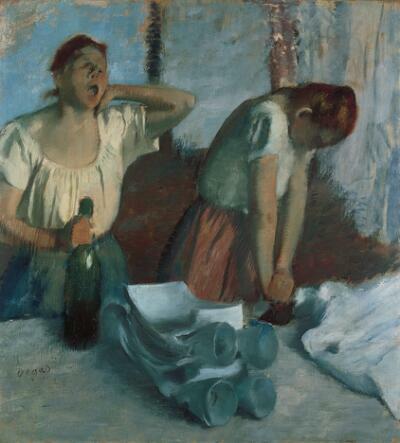 Degas painted and drew many ironers and washerwomen over a 30-year period. This is one of only a few large oil paintings—of any subject—he ever made.